Canadian Prime Minister Justin Trudeau (center), Mexican President Enrique Peña Nieto (left) and President Obama take part in the North American Leaders' Summit at the National Gallery of Canada in Ottawa, Ontario, yesterday. Photo courtesy of AP Images. North America's energy politics got a little more intertwined yesterday as President Obama, Canadian Prime Minister Justin Trudeau and Mexican President Enrique Peña Nieto agreed to green the continent's power and petroleum sectors and present a joint front across a range of international negotiations. Environmental activists, many of whom are still grappling with the climate impacts of Britain's exit from the European Union, hailed the air of cooperation at the North American Leaders' Summit. "As Europe is disintegrating, North America is integrating, and it's integrating in a way that I think provides real and substantive and tangible benefits to the citizens of the three countries," said Drew Nelson, senior manager for natural gas at the Environmental Defense Fund, in an interview from Ottawa, Ontario, where the gathering took place. Andrew Light, a senior fellow at the World Resources Institute who previously served in the State Department, said yesterday's deal is by far the most comprehensive joint agreement on climate and energy policy in which the Obama administration has been involved. It reads like a regional policy integration plan, he said. "It just includes everything," he said. "It's the first time we've seen this level of sophistication of coordination among countries outside the E.U." The deal starts with a pledge by the United States, Mexico and Canada to draw 50 percent of North America's power from no-carbon sources by 2025. It goes on to include detailed joint commitments on oil-and-gas-sector methane and pledges to collaborate in multilateral negotiations ranging from heat-trapping hydrofluorocarbons to commercial aviation emissions. North America's "Three Amigos" promised to synchronize their work on heavy-duty diesel vehicle regulations, transmission infrastructure, and government renewable energy and efficiency procurement activities. They pledged to join last year's Paris climate deal this year and to work together to formulate long-term emissions reduction pathways that will build on its ambition. But many of the details of the agreement remained unclear, including how it would be implemented and whether it would survive if GOP presumptive presidential nominee Donald Trump follows President Obama to the White House. Here are seven key unanswered questions about the deal. 1. What is each country promising to do? The deal centers around the tri-country pledge to "strive to achieve a goal for North America" of deriving half its power from non-emitting sources by 2025. The broad numbers were leaked to the public Monday, and some observers were mildly surprised when the details unveiled yesterday included such conditional language. It is unclear why the language allows so much wiggle room, but some noted that Canada is currently in the process of formulating a national climate framework with substantial input from the provinces. Trudeau's government may be anxious not to step on that. "It didn't strike me as incredibly worrisome, though, just because the number is very impressive," said Light. The 50 percent clean power pledge is roughly consistent with what the International Energy Agency says the Western Hemisphere's four Organisation for Economic Co-operation and Development members -- the three North American countries plus Chile -- must do to help the world avert the worst impacts of warming. And it requires more action than is currently in the pipeline, even including U.S. EPA's embattled Clean Power Plan. Like many recent climate agreements -- most prominently last year's Paris Agreement -- the North American deal is binding only politically, not legally. But observers said it provides for much stronger coordination between participants than the global agreement does, and the political consequences of breaking promises to close neighbors and allies are more direr than those of breaking promises made in the context of a 196-party agreement. "The smaller the club, the more pressure there is," said Light. Erin Flanagan, director of Canada's Pembina Institute, said the vague language wouldn't give countries cover to renege on their commitments. "I think it's fair to say that peer pressure is part of the negotiating tactic," Flanagan said. North America will now have credibility to press other countries to take some of the same steps it has taken in this agreement, she said. 2. So what happens if Donald Trump is elected president? Yesterday's deal depends on all three countries doing more than they are right now, but in the case of the United States, that seems particularly risky in light of November's presidential election. While EPA has begun looking at methane restrictions for existing gas wells, those rules are not expected to be in place when Obama leaves office. And the Supreme Court's decision to halt the Clean Power Plan early this year casts some doubt on the United States' ability to do its part to decarbonize the power grid. While greens dispute that a President Trump could derail Obama-era policies, industry advocates say another political agreement is unlikely to spur new investment. "In some cases, investments may already be in motion, but in reality, those investments will likely go forward anyway," said Frank Maisano, who represents clients from a variety of sectors at Bracewell LLP. "This creates more forward momentum but is also a lot of window dressing." Other analysts say that because the goal is spread across three countries and doesn't have the force of law, it's unclear what it might mean for clean energy growth in the United States. Timothy Fox, a vice president at ClearView Energy Partners, noted that "there isn't a clear market driver present in this commitment." Fox said it doesn't appear that the federal government can mandate the goal, and the plan does nothing to motivate states to generate cleaner power. "At the end of the day, this is a nonbinding agreement," Fox said. "The important generation market drivers are the state renewable energy portfolio standards." He said Obama is agenda-setting, more than spurring a shift toward cleaner power. "We think this is more of an effort by President Obama to articulate Democratic principles, particularly during this election year," Fox said. 3. What happens if nuclear plants go offline? What counts as renewable power? The 50 percent goal for the three countries includes power from "renewable, nuclear, and carbon capture and storage technologies." In the United States, large nuclear plants represent about 20 percent of carbon-free generation. But nuclear units are at risk of shutting down because of competition from cheaper natural gas and renewable power. Fox said achieving the goal "relies heavily on the existing nuclear fleet," yet the plan does nothing to pressure policymakers to keep nuclear power online. If nuclear plants retire, it's possible natural gas units will help replace them, making the target harder to reach. The White House also did not specify what might count as "renewable" energy. Proponents of biomass energy -- electricity generated from wood or other plant materials -- insist that their industry should get credit under the ambitious North American clean energy target. Plants absorb carbon dioxide when they grow, so biomass energy advocates say the net effect of burning biomass is good for the climate. But environmental groups like the Natural Resources Defense Council disagree, arguing that some forms of biomass use can exacerbate climate change because it takes too long for plants to reabsorb the carbon dioxide produced by burning the fuel. Whether biomass is counted could be a political sticking point in implementing the plan. 4. How do energy efficiency and carbon capture and storage fit into the goal? The announcement also does not explain how power savings from energy efficiency could help achieve the 50 percent goal. Steven Nadel, executive director of the American Council for an Energy-Efficient Economy, named two possible ways energy efficiency's contribution could be calculated. One method would be to look at the total amount of power produced in 2025 from various sources, determine how much energy efficiency is helping to reduce the amount of total power used, and factor that into the 50 percent figure. Or the countries could determine a set increase in energy efficiency and include that in the target. "But then you have to define what the start year is," Nadel said. Fossil fuel plants that use carbon capture and storage (CCS) could also count, under the terms of the goal. But the coal lobby and energy experts quickly threw cold water on that idea, arguing that CCS won't be ready to scale in the near term. "There are no scalable plants anywhere in the world with CCS, and none will ever be built in this country thanks to regulations promulgated by this administration," said Laura Sheehan, senior vice president of communications for the American Coalition for Clean Coal Electricity. 5. What does it mean to 'phase out inefficient fossil fuel subsidies'? The plan also includes a provision to "phase out inefficient fossil fuel subsidies by 2025," in keeping with a commitment that Group of 20 nations made in 2009. So what exactly is an "inefficient" fossil fuel subsidy? The definition depends on the country, according to Joseph Aldy, an associate professor of public policy at Harvard University's Kennedy School of Government. G-20 countries likely decided on the term because they wanted to allow room for some fossil fuel technologies they might want to support -- including those that could help reduce greenhouse gas emissions -- said Aldy. But they never came to an agreement about what constitutes an "inefficient" subsidy. So Saudi Arabia, for example, has claimed it does not have any inefficient fossil fuel subsidies, although estimates have shown the government provides incentives of one kind or another amounting to tens of billions of dollars, Aldy said. The U.S. government has focused mainly on about 10 core tax expenditures, amounting to $50 billion over 10 years, Aldy said. President Obama has proposed eliminating them from the federal budget each year, but Congress has denied his requests. Aldy said it's difficult to cut the subsidies in stand-alone legislation, but it might be more feasible as part of a broader tax reform package that lowers corporate tax rates. For sure, the fossil fuel industry would lobby hard against any changes to favorable tax treatment, although the American Petroleum Institute maintains the oil and gas sector does not receive subsidies. "Industry doesn't get subsidies so I'm at a loss at where your information is coming from and how to respond," said API spokeswoman Sabrina Fang, pointing to API's explanation of industry tax treatment. Alex Doukas, a senior campaigner for a group that lobbies to eliminate fossil fuel subsidies, Oil Change International, said that even if Obama or his successor couldn't eliminate favorable tax treatment with the help of Congress, the White House could take steps unilaterally. For example, the executive branch could initiate a review of oil and gas leasing on federal lands. Obama has started a similar review for the coal leasing program. And the president could "stop sending money to support fossil fuel production abroad," Doukas said. 6. How will this new shipping emissions agreement work? Also yesterday, leaders vowed to work together through the U.N. shipping agency, the International Maritime Organization, to curb greenhouse gas emissions from international shipping. It remains unclear, however, how they'll do that and to what degree the United States is willing to shift from a previous lukewarm position. International shipping contributes around 2 percent of global greenhouse gas emissions. Earlier this year, a group of countries led by the Marshall Islands called for the body to define shipping's contribution to global emissions reduction targets and start working on a sectorwide plan. The goal was to align the U.N. agency's approach with those of the countries signing onto the Paris deal. The United States sided against the proposal, however, and punted further discussion to the fall. The United States instead pushed forward the first part of a multi-step plan to collect, monitor and ultimately reduce emissions from shipping. The White House announcement yesterday included a nod to that effort but also had separate language touting measures to address greenhouse gas emissions from shipping. "Now that data collection has been finalized, we could see greater U.S. support for the push to establish sectoral targets, as well," said Dan Rutherford, who works on maritime and aviation issues for the International Council on Clean Transportation. "It sort of signals that they are viewing that data collection as a step towards additional measures, especially existing ships." 7. 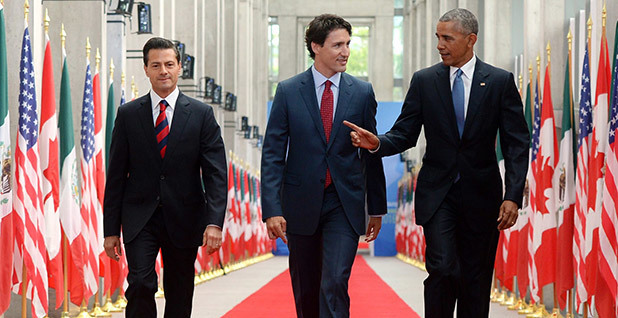 How can North America collaborate on its long-term Paris goals? Yesterday also saw Mexico join the United States and Canada in pledging to submit a 2050 strategy for deep emissions cuts under the Paris Agreement later this year. It is one of the first developing nations to make that pledge. The three countries also committed to a "trilateral dialogue" while formulating those strategies. But it is unclear what that document will look like or how the countries will jointly chart a course for a low-carbon economy 35 years into the future. Alden Meyer of the Union of Concerned Scientists said it is politically significant that Mexico volunteered to put forward its document early and that the three countries plan to work together. "Given the integration of the energy and transportation markets on the North American continent, it makes sense to look at doing things together in a coordination way," he said. "If you're talking about infrastructure investments, if you're talking about policy considerations, if you're talking about avoiding leakage of carbon-intensive development -- the more you can do it at a continental scale, the better." White House Deputy Director for Climate Policy Richard Duke is heading the interagency effort at the White House that will produce the long-term strategy, and some within the administration have described it as a white paper rather than a detailed projection of future policies and regulations. But activists have said they expect the world's largest historic greenhouse gas emitter to give at least some details of how it plans to put its economy on track to help limit post-industrial warming to well below 2 degrees Celsius -- the long-term goal of Paris. Meyer said he expects the product to be more of a road map than a laundry list of policy items. "It's a little more blue-sky thinking," he said. The three governments share economic and technological assumptions after yesterday's accord, he said. Reporters Elizabeth Harball and Camille von Kaenel contributed.